13 years later, Cleantech Open has helped foster the clean tech movement globally, with over 1500 startups accelerated worldwide, who’ve raised 1.2B$, and created over 3000 jobs. Over the past decade, organizations to support cleantech entrepreneurs have been created all over the world. There are numerous types of programmes and structures, matching all the different needs of the life cycle of the companies, from idea stage startups to large ventures. These organizations are crucial for Solar Impulse Foundation’s #1000Solutions Challenge. Thanks to the support of these network partners, we are able to identify hundreds of brilliant innovators. 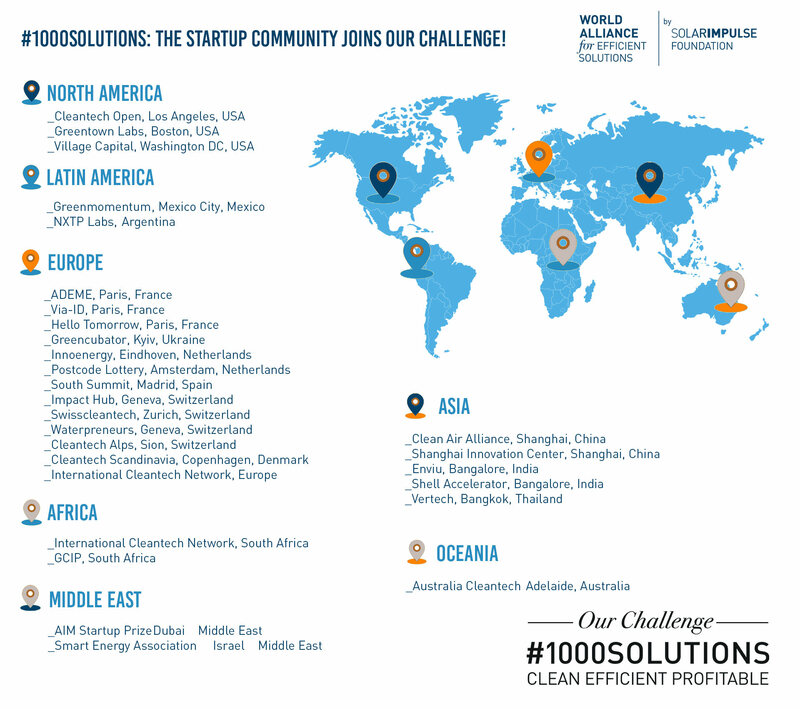 Just like the Solar Impulse solar flight around the world, our #1000Solutions challenge is a collective one, which we will only accomplish by joining forces with many stakeholders. First step toward success is to validate your idea: Is there a demand for my product/service? Which problem am I solving? What is the size of the market I’m addressing? Startup weekends, pitch competitions, and startup contests are perfect for answering these questions. Luis Aguirre-Torres is the Director of GreenMomentum and President of Cleantech Challenge México, one of the biggest cleantech startup competitions in Mexico. “The mission of Cleantech Challenge Mexico has always been to promote innovation and adoption of clean technology in our country”. In November 2017, for the 8th edition of Cleantech Challenge México, Kinetech Power Systems was nominated as the “Best Green Company in Mexico” for their “low-cost, flexible duration - long or short - flywheel energy storage system (FESS)”. In addition to the startup contest, GreenMomentum has created a startup incubation programme, as well as a think tank to work with policy makers. “We know that we can not succeed alone. We need to work together with other organizations to help entrepreneurs. Being part of the World Alliance for Efficient Solutions was a no brainer!” says Luis Aguirre-Torres during Bertrand Piccard’s recent visit to Mexico. For entrepreneurs, being part of an ecosystem is crucial to thrive. Innovation hubs are perfect for them because they combine many of their needs: whether it’s being inspired at an event, meeting people, working in a creative environment, or getting advice from fellow entrepreneurs. That’s exactly what Impact Hub Geneva is made for. “We connect entrepreneurs to an entire ecosystem. We bring mentorship, tools, network, to startups of all maturity levels” says Amanda Byrde, Founder of Impact Hub Geneva and Lausanne. It’s part of a much wider organization, the Impact Hub Network. With 92 Impact Hubs active on 5 continents, it is one of the world’s largest community of entrepreneurs. “Our members get access to a network of 16000 people thanks to our online platform and app” adds Amanda. Of course, building a successful company isn’t just about the idea, or the network. You need money. That’s where companies like Bamboo Capital Partners comes in. “We are an impact investor in developing countries” describes Florian Kemmerich, Managing Partner at Bamboo Capital Partners. Impact investing refers to investments "made into companies, organizations, and funds with the intention to generate a measurable, beneficial social or environmental impact alongside a financial return". Founded in 2007, Bamboo Capital Partners is a pioneer in the impact investment industry. Today, they manage $300 million across 37 companies and over 33 countries. “According to our last impact report, we’ve helped to create 30,000 jobs and impacted the lives of 96M people” says Florian Kemmerich. Indeed, they do. And all these network partners all around the world are helping us find them to achieve our goal of selecting 1000 clean, efficient and profitable solutions, which Bertrand Piccard will present to decision makers in 2019. Do you have a community of cleantech entrepreneurs? Want to become a network partner of the Solar Impulse Foundation? Join us now! Next article Solar Impulse Foundation and UN Environment call on all innovators to “Beat Plastic Pollution”!